It’s been said that there’s great strength and power in community. At the Looking Glass Foundation, we definitely believe that. It’s with our bighearted community of people and organizations, that we truly can make a difference in the lives of others, in the lives of those fighting eating disorders. Together, we can move this disease from silence and isolation towards conversation and community. One of these organizations is Sympli, a Canadian fashion manufacturer that feels we should all be accountable for holding women’s body image with kindness and respect. Sympli believes that everyone should be aware of their power to create an impact, and this shared belief is what brought Sympli and the Looking Glass Foundation together. Believing that "all women should love who they are without compromise", Sympli manufacturers an extensive line of flattering clothing that is is designed with purpose, and crafted with heart. They want women to wear clothes as a compliment to their individual personality, mood and purpose – and to dispel the myth that they would be happier with a 'perfect body'. Not only are they redefining how the fashion industry can make women feel good about themselves ... they are also showing women how to take back their power and create positive change. May the movement grow and flourish! 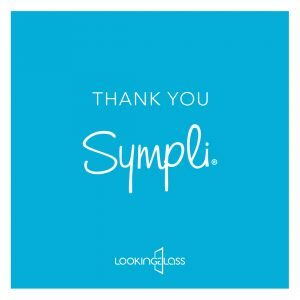 Anyone who's ever been to a Looking Glass Gala knows that Sympli donates generously to the Foundation, and has done so for many years. And they continue to amaze us with their support such as donating all of the proceeds from their upcoming 2-day Warehouse Sale to Looking Glass. We can't believe that it's been almost 10 years since this wonderful relationship with Sympli began. Calling them "a source of passion, love, and unending support", Looking Glass co-founder Deborah Grimm recalls when Sympli first began supporting the Foundation. "They arrived on our doorstep out of the blue, embraced us and just never let us go", she says. "They have taught me so much about life and goodness, and I know I will never be able to truly express the depth of gratitude I feel for their trust and generosity." The Looking Glass Board Chair, Debbie Slattery, echos the same gratitude. “Sympli has been a long-time supporter of the Looking Glass Foundation and we are deeply grateful for their commitment to raising awareness about the work we do and for creating the space for women to feel comfortable in their bodies." Since 2009, Sympli has enabled Looking Glass to support hundreds of people, and their loved ones, dealing with this serious mental illness. Together, we can continue the dialogue around positive body image. Together, we can encourage every person to value themselves just as they are. Together, we can embrace those impacted by eating disorders and support individuals on their paths to recovery. A big Thank you to the wonderful team at Sympli – for giving so much, and in so many ways. Join us on November 22nd - 23rd for Sympli's semi-annual Warehouse Sale at the Burnaby Scandinavian Community Centre. 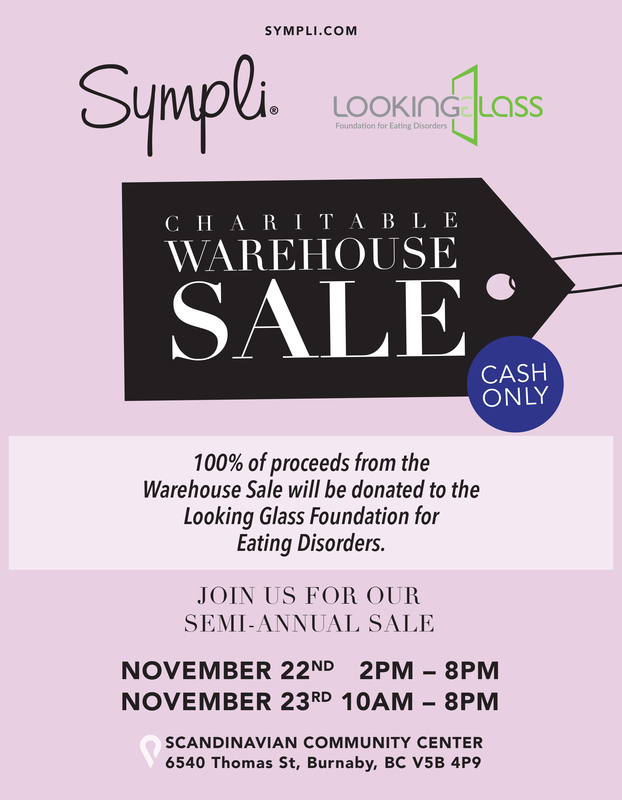 All proceeds from this 2-day Warehouse Sale will be donated to the Looking Glass Foundation. Get a jump on your holiday shopping, and support a local business and LGF while you're at it!